Reputable dealers are often happy to allow their customers to try out hot tubs and spas they’re interested in. A test soak gives you a feel for the models you’re considering. 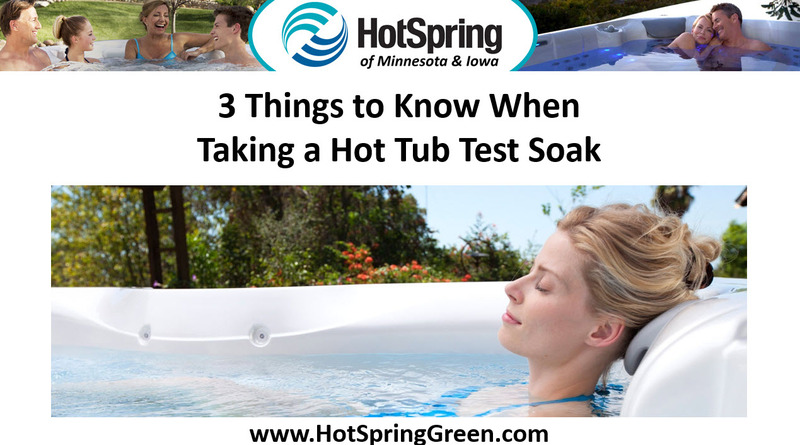 Here are three things to know when taking your first hot tub test soak. If you plan to entertain in the hot tub, consider bench style seating for more space. If personal hydrotherapy is your goal, you may want to try out a performance lounge-style seat. With all seating arrangements, make sure you don’t float out of the seat, or have to struggle to sit back and relax. Just as important as comfort is how the spa sounds. Listen to the sounds around you. Is the hot tub quiet? Can you hold a conversation or listen to music easily without the distraction of loud pumps? Change the setting on the jets and listen carefully to how the sounds change as you adjust to ensure no surprises on delivery day. Easy water care is an important part of spa ownership and the test soak is your chance to see just how clean spa water can be. Ask your dealer to explain their water care products and don’t be afraid to ask questions. Leading brands are improving their water care systems making it easy to find user friendly, even automated solutions.